The pressure is on for the contemporary Muslimah, how can she be modest but still express her individuality? Muslim women are at the forefront of this new challenge, designing and producing unique clothing instead of relying on high street stores.The clothing is modern, inspired and unique. Versatile clothing not only restricted to Muslimahs. Have a look at these five awesome brands for the fashion conscious Muslimah..
Inayah is a popular and cult brand that has gained a massive following. Their designs are full of classic cuts and simple elegance. Elements of florals, vintage accents and soft hues make irresistible pieces. The clothing feels modern and the selection of headscarves means whatever piece you choose is sure to match any outfit. The clothing is versatile and stylish, with a minimalist vibe and simple silhouettes. These are timeless pieces that can be worn again and again and mixed with your current clothing. Left: The Olive Maxi Jersey Hijab is a bestseller (and sold out along with many other scarves) Practical and simple it is a worthwhile addition to any wardrobe. Right: On the pricier side of £29.99 this silver pure silk scarf is luxury. Perfect for anyone who wants to add a special touch to an outfit. Inayah is in the mid price range, reasonably priced for good quality and carefully designed clothing. Of course following the care label instructions will increase the longevity of your garments. 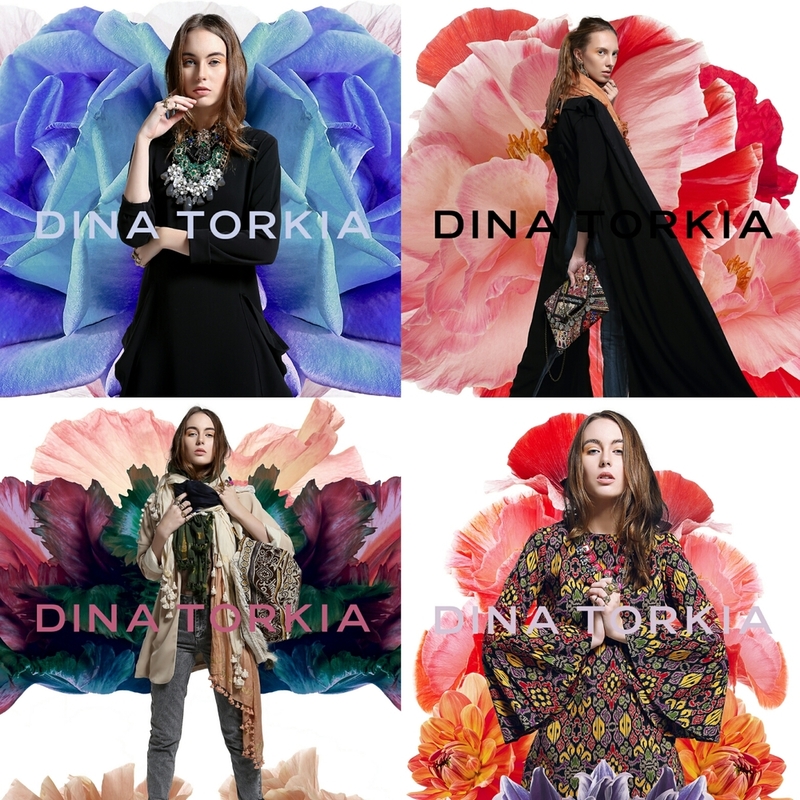 YouTuber Dina Torkia is much loved for her individual and innovative fashion sense. Dina has already released a line of headscarves inspired by her Egyptian heritage and gorgeous ombre dip dyed scarves that were an instant hit. Also newly released and a complete sell out is her Debut Collection. Keep two eyes out for her next collection and claim yourself a unique garment. The campaign photos are a delight to look at, professional, creative and colourful, Dina's clothing is not for the hijabi only but every woman. The website has a simple straightforward layout, with all the clothing well categorised. 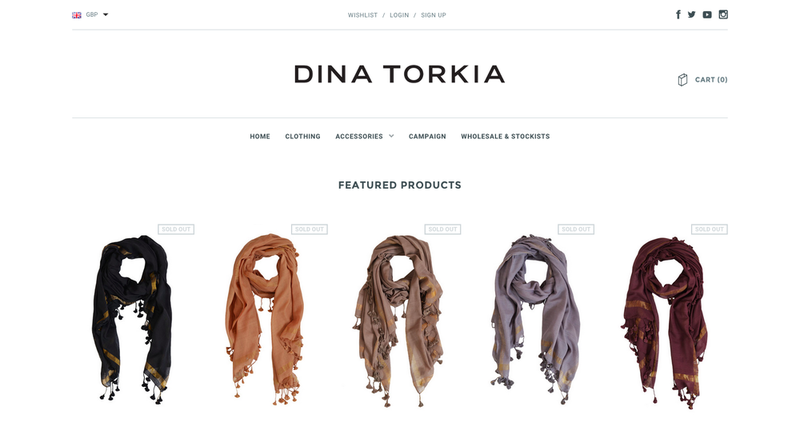 Dina has a great modern looking website that is well designed and easy to navigate. Anna Hariri is a modest clothing atelier. Although on the pricier side, Anna's designs are classic and handmade from high end luxury fabrics. She offers beautiful dresses in gorgeous patterns, sell out skirts, and abayas inspired by traditional and modern design. If you want guaranteed quality and long lasting pieces look no further. An abaya inspired by a modern colour block design. The neutral colours work perfectly togethers. The Anna Hariri website is busy to look at with most of the clothing displayed on the home page. Special offers and a loyalty scheme is available, such as buy two pieces and get the third free. A great way to plan Eid or wedding outfits, for both you and the family. The fourth brand we reviewed is an East Shopping Mall favourite, Aab Collection, a prestigious yet affordable high street brand specifically catering to the modest market. With friendly service and convenient worldwide shipping, it's obvious why Aab pieces have become a closet gem. The contemporary modest clothing company stock a range of jersey and chiffon hijab's as well as a variety of abayas, formal trousers and accessories. The average price of an abaya falls around the £50.00- £150.00 mark and my personal favourites would have to include the Mulberry Sunset Pink dress and Neroli abaya for their simplicity and class. If you don't have an abaya from Aab in your wardrobe why are you still reading this? Head over to their website or visit their London Boutique on Green Street, I guarantee you won't be disappointed. Modest fashion doesn’t exclude the high end luxury attire of our flawless fashionista counterparts, often striving for an audacious yet effortlessly opulent evening look. Islamically, it’s crucial modesty is observed in all aspects of our appearance, which contemporary couture designer Subeena Z certainly advocates. “Simplicity inspires me” she explains, highlighting that modesty doesn’t necessarily need to be compensated with overtly extravagant embroidery. “Personally I don’t mind sparkle, but I felt like sometimes it can be too in your face, my clientele are people who understand less is more”. Certainly, from her best selling garments The Annie and The Maleeha, it’s not hard to see what she means. 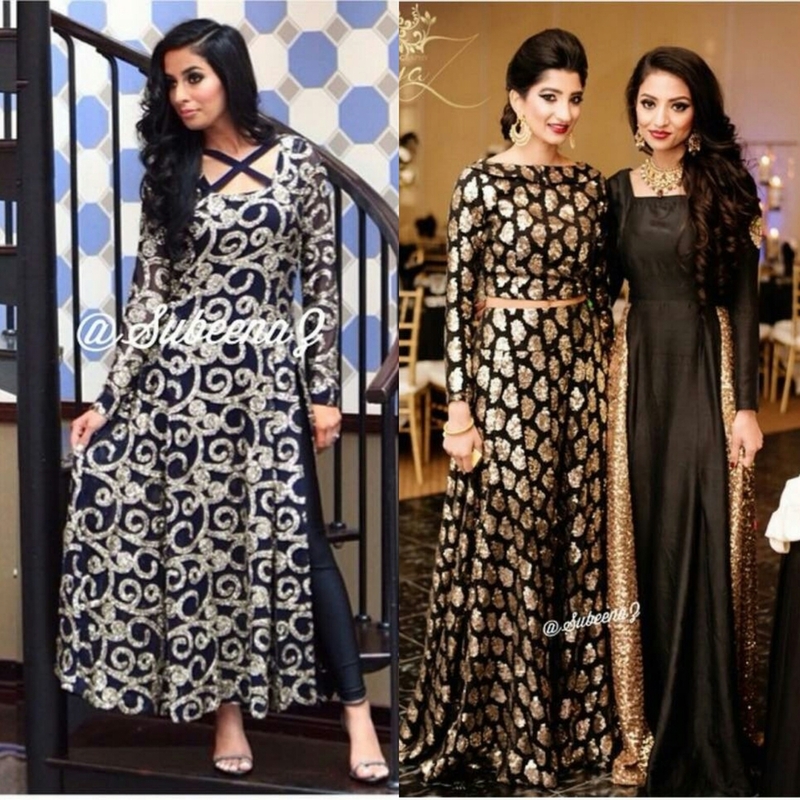 Based in Chicago, Subeena Z definitely appeals to our international audience in search of something truly spectacular.“I design for women who don’t mind being the centre of attention” and with pieces ranging from $180-$360, you certainly get what you pay for. Subeena loves to work with chiffon and silk as they subtly scream ‘elegant yet daring’, complimenting the Inayah hijab collection perfectly. Orders are strictly by email subeenaZ@gmail.com and more of her incredible designs can be viewed on Instagram @SubeenaZ or at selected fashion exhibits up and down the US, most recently showcasing at the ISNA exhibit. And thus concludes the list of the Top Islamic Clothing Brands. Please note that this post is a compilation and not a ranked list, all brands have their great qualities and we feel that fashion in particular is a personal choice based on individual ideas. Please do check out all listed sites and support this every growing section of Muslim commerce. If you have enjoyed this post feel free to share it! If this is your first time checking out BAHATH have a look at our ABOUT page to learn more about us!